The 21st session of the General Assembly will be held at UNESCO Headquarters, 14-15 November 2017. In accordance with Article 8, paragraph 1 of the Convention concerning the Protection of the World Cultural and Natural Heritage, the General Assembly of States Parties to the Convention will hold its 21st session during the 39th session of the General Conference of UNESCO. The General Assembly will be called upon, inter alia, to replace the outgoing members of the World Heritage Committee, in conformity with Rule 13.1 of the Rules of Procedures of the General Assembly of States Parties to the World Heritage Convention concerning the presentation of candidatures for election to the World Heritage Committee. For information on the number of seats to be filled during the 21st General Assembly, click on your preferred language. ** At its 20th session (UNESCO, 2015), the General Assembly approved the following format for the experts’ CVs in the field of cultural/natural heritage. Working documents can be consulted online. How many Committee members are there? There are 21 Committee members represented by 21 States Parties to the World Heritage Convention . 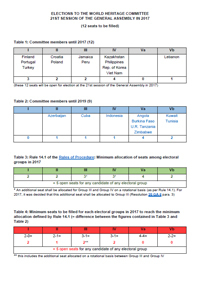 Who are the Committee members in 2017 before the elections? Which members are leaving in 2017? Which members will leave in 2019? When do the elections take place? Elections to replace outgoing Committee members take place during the General Assembly of States Parties, meeting every two years during the General Conference of UNESCO (Article 8.3 of the Convention ). The 21st session of the General Assembly of States Parties to the World Heritage Convention will take place during the 39th session of the General Conference of UNESCO in November 2017 (dates to be confirmed). How long is the mandate of a Committee member? According to the Convention, a Committee member's mandate is for 6 years. The General Assembly (Resolution 13 GA 9, paragraph 6) invites the States Parties to the World Heritage Convention to voluntarily reduce their term of office from six to four years. How many seats are available at the 21st General Assembly in 2017? In 2017, a total of 12 Committee members will be elected. Can an existing Committee member present a candidature during the year when their mandate is finishing? According to Rule 13.2 of the Rules of procedure of the General Assembly, members of the World Heritage Committee may stand for election again after a gap of 6 years after the expiry of their mandate. Is there a geographical distribution of Committee members? 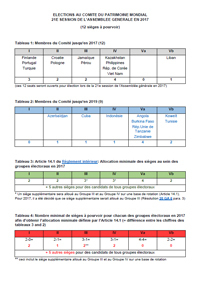 Following the 1st Extraordinary Session (UNESCO, 2014), the General Assembly amended its Rules of Procedures in order to achieve the goal of an equitable geographical and cultural representation on the World Heritage Committee, through the allocation of seats by region (defined with reference to UNESCO’s electoral groups) on the World Heritage Committee. For more details please refer to Article 14 of the Rules of Procedures. What is the deadline by which a State Party should submit its candidature? As per Rule 13.1 of the Rules of procedure of the General Assembly, candidatures should be sent to the Secretariat at least six weeks prior to the opening of the General Assembly. As per Rule 13.4, this list of candidatures shall be finalised 48 hours before the opening of the General Assembly. No other candidatures nor payments of compulsory and voluntary contributions to the World Heritage Fund (for the purpose of presenting a candidature to the Committee) will be accepted in the 48-hour period prior to the opening of the General Assembly. "Any State Party to the Convention which is in arrears with the payment of its compulsory or voluntary contribution for the current year and the calendar year immediately preceding it shall not be eligible as a Member of the World Heritage Committee, although this provision shall not apply to the first election." Is there a special provision for States Parties with no property on the World Heritage List? No, there is no provision. Is there a special provision for States Parties which have never served as a member of the World Heritage Committee? The Rules of Procedure adopted by the General Assembly in November 2014 state that “at each election, due consideration shall be given to the election of at least one State Party which has never served as a Member of the World Heritage Committee" (Rule 14.1d). See Statistics on States Parties. How many voting rounds are there? What happens when two States Parties obtain equal votes? Please refer to Rule 14 of the Rules of Procedure of the General Assembly: "Election of the members of the World Heritage Committee"
How can I access the related reference documents of past statutory meetings : Resolutions; Decisions; Committee Reports; General Assembly Summary Records; Rules of Procedure, etc. ?